This book examines some of the golden years of Tal’s career, from 1960 to 1971. Despite losing his world title in a return match against Botvinnik, Tal remained one of the strongest, not to mention most popular and entertaining, players in the world. As in the first volume, cutting-edge chess analysis is complemented by the engaging story of Tal’s life and career. The book also contains numerous anecdotes from famous players who share their memories of the Magician from Riga. "Another nice touch is that Karolyi has asked many of Tal's opponents about the games they played with Tal and their impressions of Tal, which adds an extra human dimension to the book. But of course, the most important thing about all these books are the games and the analysis and for both I have only the fullest admiration. Perhaps the most impressive thing about Karolyi's annotations is that he doesn't only focus on brilliant Tal attacks, but also spends a lot of time on many of the weird and wonderful endgames that arose as a result of his sacrifices. It feels a little bit like overdoing things to give 5 stars to a set of three books, but if any Best Games collection has ever deservd it, then this one has! Don't waste any time: get down to the bookshop and enjoy!" 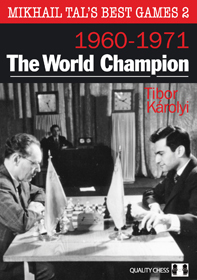 The notes to the games in the present volume, which traces Tal’s journey from winning the World Championship to 1971 when he was still among the world’s elite, are first rate. Readable, yet with plenty of concrete variations when needed, Karolyi’s annotations are insightful... No chess player can fail to love Mikhail Tal’s Best Game 2: 1960-1971"
"Tibor Karolyi and his three-volume series leaves no questions unanswered. I can warmly recommend this book to lovers of beautiful, sacrificial games." "While Karolyi includes many of Tal’s most famous sacrificial efforts, he also analyses more ‘workman-like’ games, including no small number of his endgames... The image of Tal we get through these books is of a much more well-rounded player than commonly thought. Karolyi also spends a lot of time, and obviously spent a lot of effort, contextualizing each game. In some cases he sheds light on the identity of Tal’s opponent, while in others he sketches the situation Tal found himself in while playing the game. Many personal anecdotes are relayed, and the book is much richer for it." "In the period covered by the book, Tal played many great sacrificial games... As in part one of the trilogy, Karolyi provides wonderful anecdotes alongside in-depth analysis of the games."